York Way – at last! The ‘pinch point’ by the corner of Caledonia Street is not the crossing we wanted but still very welcome. Further to my email dated the 8th of May announcing approval of the second phase of the scheme along the side of King’s Cross Eastern Range (the station building), things have progressed swiftly and we will be starting on site on Monday 21 May. I appreciate that this email is short notice, but all of the key stakeholders who manage the network and will be affected by the works have been consulted and have helpfully supported the schemes rapid progression. Please see the attached works notification for your information. We have received several requests for a scheme plan, which is attached here as a pdf. For now our works will comprise the bottom section of western footway which can be seen in the left hand window of the plan. The design has been agreed with the stakeholders and since agreement to the scheme was secured there have been no changes. 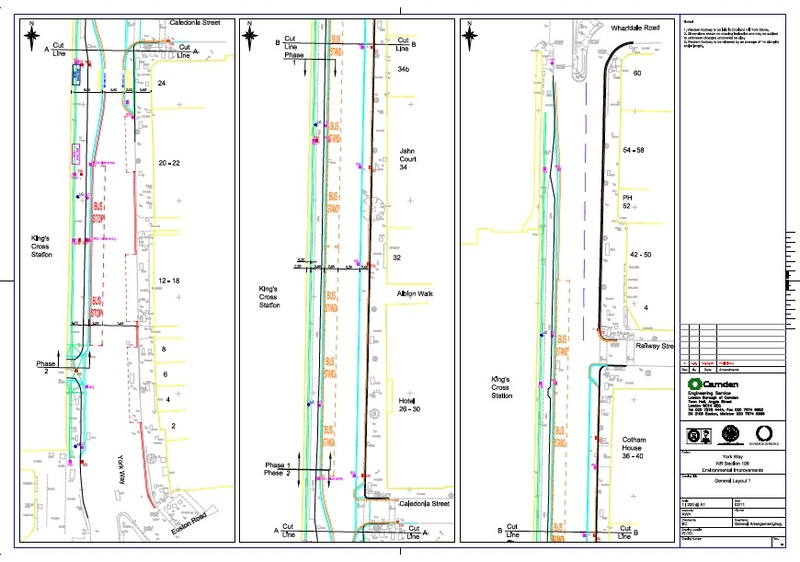 However, due to time constraints imposed by the Olympic moratorium, construction of the eastern footway improvements will now have to be undertaken after the Olympics. As well as continuing towards the completion of the overall scheme, these works also mean that many of the footways around King’s Cross and St Pancras Stations will have been improved in time for the Olympics. With respect to the taxi drop off issue at the southern end of York Way, Camden are not the traffic authority for this southern section of highway but we do support use of the new drop off facility on the other side of the station instead. However, until the new station is fully completed and the works for the new Station Square commence after the Olympics, the future of the York Way drop off remains subject to further discussion between the relevant stakeholders. Though I do note that the Network Rail website mentions the set down on York Way has closed, this may refer to the old taxi facility in the Eastern Range building itself and we will seek clarification on this from Network Rail. I will also pick up this issue in a future meeting with the public carriage office. 5 Responses to York Way – at last! Thanks for posting this, but I don’t quite understand the changes being impleminted. Can you offer some further explaination? Pavement widening both sides of the road and traffic down to one lane between bus stops and Railway St. Pavement bulges out both sides near the Fellow bar to make a silent style pedestrian crossing – not controlled as we wanted. I wanted to follow this up as there is still no safety on York Way for cyclists and it feels far more dangerous cycling up this part of York Way after these changes. It isn’t clear which side of the road it is better to cycle on – and the road at the pinch poiint is too narrow to allow a cycle and a car and I am frequently squeezed out by buses pulling out with no concern for others in order to navigate the pinch point. And the lights and layout at the junction with the Euston Road are a disaster. As both a pedestrian and a road user – neither group can get any visibility of what is happening so frequently pedestrians cross into the path of cars, buses and cycles. Also the road surfacehas deteriorated incredibly quickly after the works were done – it shows they were badly done. Anybody have any ideas what will happen with the new “square”?